Have you ever woken up with a horrible headache? Yesterday morning I tried so hard to undo what was done but couldn’t re-wake up no matter how hard I tried. I tried breathing through the blankets, I tried breathing through one nostril and then the other but failed and nearly suffocated. Stuffy noses and autumn seem to go well together, don’t they? Heck, clogged sinuses and every season go well together for me. 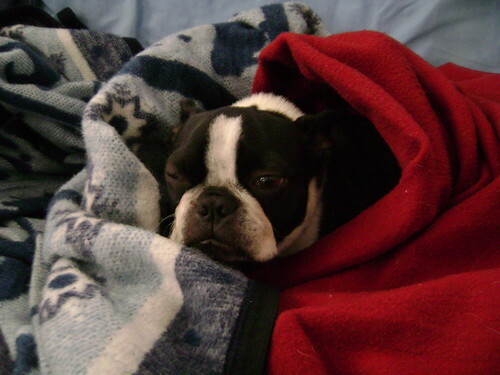 I tried massaging my temples, hiding under Iggy Pup and even smothering myself with my pillow. All to no avail. 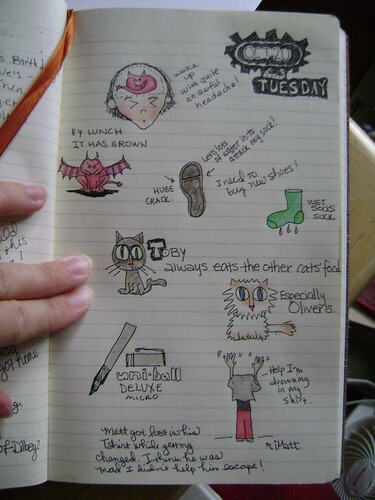 What better way to document such a horrible beginning to a stressful day than with – a doodle page in your journal?! So you see, a horrible little demon spore was incubating in my head causing the throbbing sensation behind my eyes. As the day went on, he grew wings and a love of slam dancing. I told my coworkers that in the event of my head bursting open, they should collect the pieces and capture the beast. What would be cooler than having a pet demon that came from inside your head? I could train him to do marvelous things like take paperwork upstairs and check the fax machine. By lunch I was certain that a ruptured skull was inevitable then as my plans to catch and tame this mythical entity grew and developed, I found myself without the headache. Had the lil booger reabsorbed into my brain tissue? Oh well. Maybe next time. If you have ever had a wet sock, you will completely understand why I am on a quest for new everyday shoes. My right shoe developed a nasty crack which grew into a full blown chasm. Friday night it was raining and as Matt and I rushed around to get candy for our theatre excursion, it decided to rain. Puddles and cracked shoe soles do not get along very well. I found myself dragging a sloppy wet and cold right foot along for the viewing of “Where the Wild Things Are”. Luckily I enjoyed the movie and paid little attention to my squishy sock. I can happily report that as soon as we got home from picking up Iggy Pup, I put on dry cozy warm socks and my foot lived happily ever after. Have you ever had more than one pet at a time? If one pet is eating one type of food it is inevitable that another will try to steal that food since it is clearly better than their own. Toby kitty is the worst at this. Toby will push his kitty kin out of the way and greedily scarf down their food. He also steals Cheerios from Ripley mouse and even has munched on fish food before. Iggy Pup’s kibble is not safe either… oh what a silly kitty I have. Oliver kitty has been diagnosed with kidney trouble. I refuse to say disease since it is in the early stages and he is well and happy. The food he is on is quite expensive and I’m thankful he is just a slender little frame with lots of fur who eats small amounts. Enter Jaba-the-Toby. If I don’t sit and make sure that Prince Oliver is happy and eating his food daintily, Toby will rush over and push in front of Oliver. Mister fussy pants, being a regal flame point himalayan, will turn up his nose and walk away – afterall, food that is good enough for the common kitty should not be eaten by royalty. The joys of pets – **sigh**. The bottom doodle is of Matt. Yes he was changing his clothes and insisted he was drowning in his shirt. It was quite entertaining but I fear he was upset that I didn’t rush over to save him. There wasn’t enough room for me to dive in and lifeguard him to safety. Oh and for the sake of honesty, his pajama pants were dark blue with little flags on them – not the red I used. Sorry Matt – next time I promise to realistically portray your flailing attire. So that is the summary of my doodle page. I hope you enjoyed the stories behind the doodles or at least the doodles. Matt’s parents asked me to decorate their pumpkin on Sunday. I happily grabbed the Sharpie marker and got to work. Having just seen “Where the Wild Things Are” on Friday, the characters are happily inspiring me still. 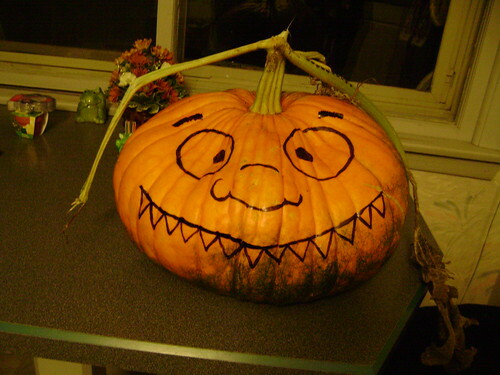 This pumpkin’s shape seemed to scream “Wild Thing!” to me. Now I just need to grab my yellow paint and go back to fill in the eyes and maybe some white for the teeth. What do you think? Some days it feels like I’m being watched over. Some days I am. 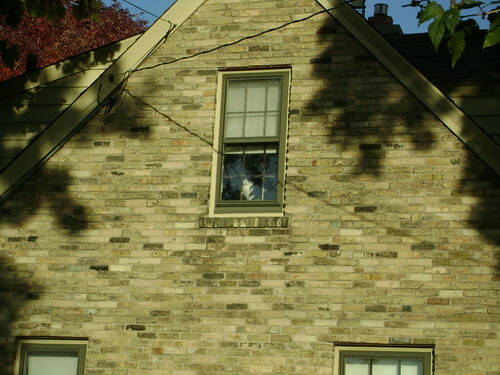 That is Lavinia kitty in the window watching Matt and I embark on our day. 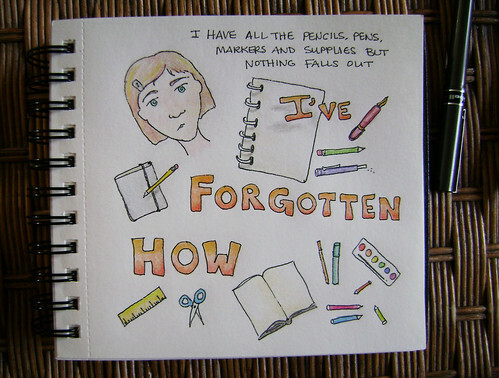 Some days I feel like I’ve forgotten how to create. I buy all kinds of pens and art supplies but for what reason? If I can’t pick up a stick and scratch something into a dirt pile, what is the point? Other days, I get a tingle and something falls out of my pen. 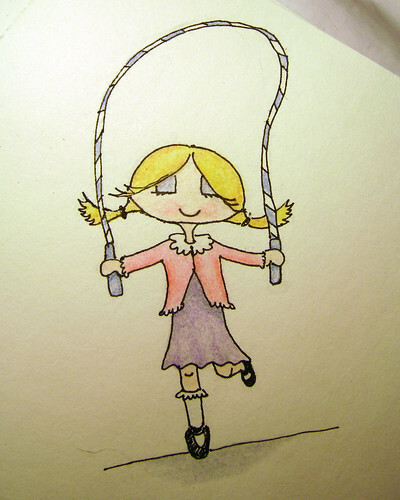 I call this one “Jump Rope Girl”… obvious eh? I make an effort everyday to notice something that I might normally miss out on. How many times do you fail to SEE what is near you? Beauty is everywhere, you just need to be ready to take it in. Once in awhile I get a good idea. 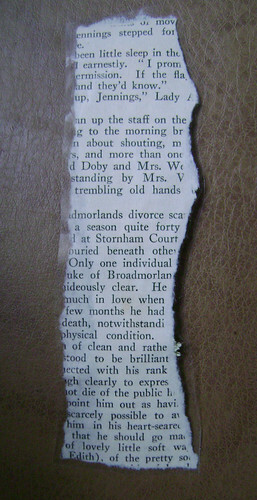 Here is the long awaited story behind the bookmark. I must offer the disclaimer that this is neither very interesting nor worth the wait so I offer preemptive apologies too. Once upon a time, I sent a package out to @michaelramm but as I was about to seal up the envelope – it hit me how lacking it was. I couldn’t send it before putting something else into that echoing chasm of envelope. A piece of drawn artwork was out of the question since nothing decent had fallen out of my pens in quite awhile. I ran through a mental list of possibilities. I have a stash of dried Queen Anne’s Lace. I made a point of cutting some when were were out at the dog park. 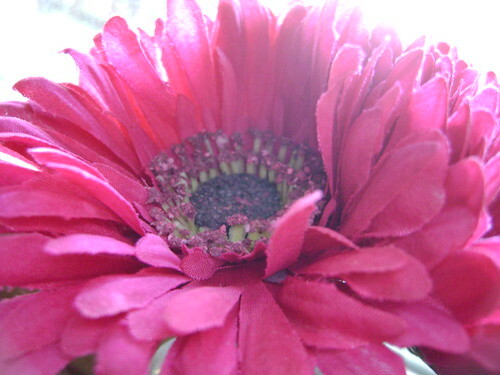 The flowers are gorgeous but dried, they take on a new life. They remind me of frozen fireworks, suspended in time and space. 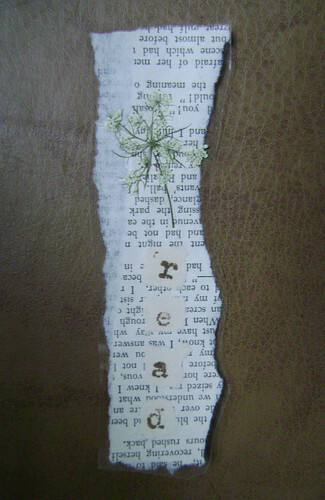 The color is muted and delicate much like the many vintage books that exist in my “cut up” piles. I also had a roll of packing tape handy since I wasn’t about to wait for glue to dry. I slept much of this weekend away. I find myself exhausted and run-down but the naps have helped. Maybe I’m fighting off a germ or virus or maybe I’m adjusting to the shorter days and colder temperatures. Is it possible for a human to hibernate? Iggy Pup asked if we could this morning. I found it very difficult to say no. I spotted Moleskines on sale at Barnes & Noble and spent a good long while picking up and examining many of the available options. The small versions are around three by five inches which would be a nice size to tuck in a back pocket or kangaroo pouch in my hoodie. In the end I walked away empty handed like so many times before. So much money for a tiny notebook. So much money for something that… I could DIY! The chilly weather led to the opening of a new thermal shirt this past week. The packaging included a piece of cardboard. I saved it like I save so many odds and ends that might come in handy. I chopped that piece of cardboard down and then opened my new ream of 22lb paper. I chopped that down. Then came the great debate. Should I hand sew the binding like I have done for all my previously made books or should I give the sewing machine a try. Out came the sewing machine. I tried to adjust the stitch length to the longest but had some trouble keeping the stitches exactly in the center. I was thrilled that this ended up not mattering in the final cahier. Having the signature and cover piece in hand, I opted for the DIY easiest method. I have to admit by this time I was feeling a bit lazy and grabbed the closest bottle of Elmer’s school glue. (Yes, I have bottles of glue lying about the house.) I made sure to apply glue along the stitches to ensure nothing came unraveled and then pressed the signature into the cover. I folded that baby up and put it under my ginormous stack of library books to dry. 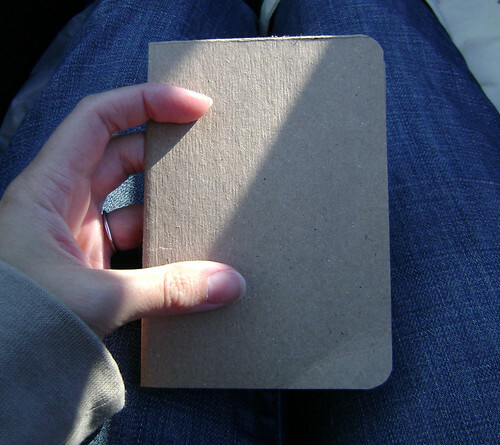 After some corner rounding and gentle spine manipulation, I admired my Mock-skine Cahier. Best part – it was made for just pennies and reused some packaging materials! 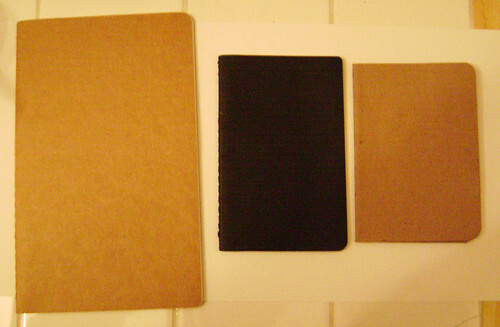 The above pictures shows a large sized Moleskine Cahier (5.25 x 8.25 inches), a pocket sized cahier (3.5 x 5 inches) and then my slightly smaller Mock-skine. Not too shabby, eh? My apologies go out to @michaelramm for not getting the bookmark included in this post. I promise it will be the next to appear here. I’m probably not doing it right. 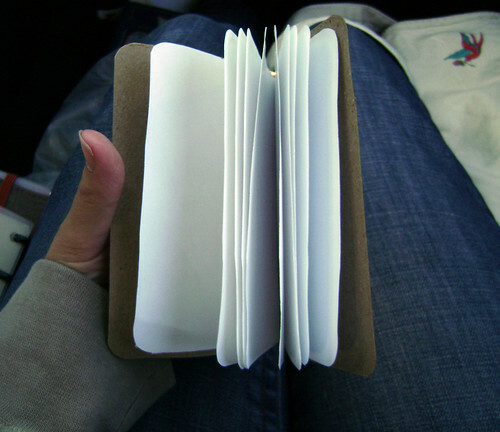 I’m using it as a place to keep track of things that capture my attention or inspire me or amuse me. Maybe if you are a Tumblr user you could offer some pointers or if you like what I post, add me to your friends. If you are new to the idea of Tumblr perhaps join me in a quest to do it all wrong and enjoy every minute of it! It is free so there is nothing to lose.